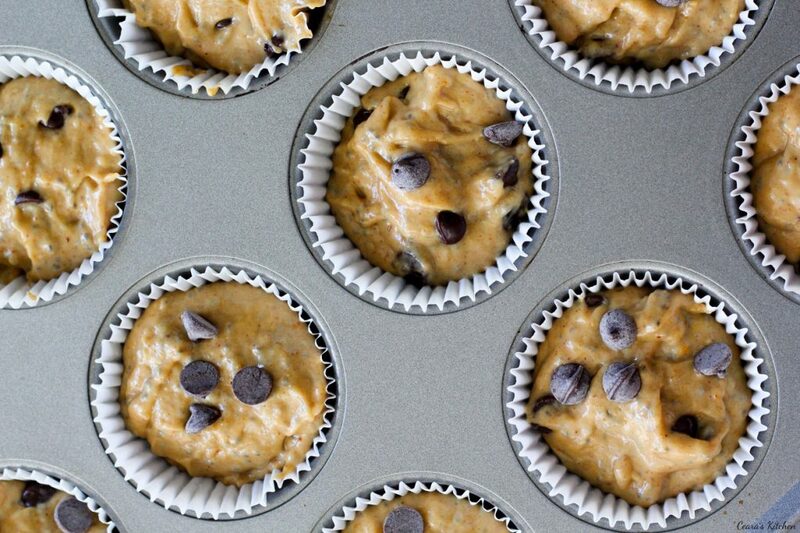 Flourless Peanut Butter Muffins ready in 30 minutes with only 8 ingredients. 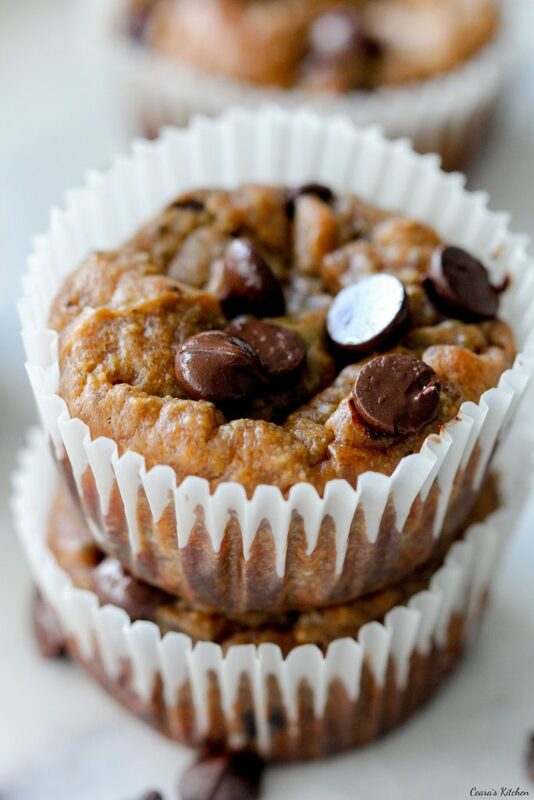 These Peanut Butter Banana Muffins are super moist, filled with melty chocolate chips and make the perfect healthy dessert or snack! How have you guys been?!? 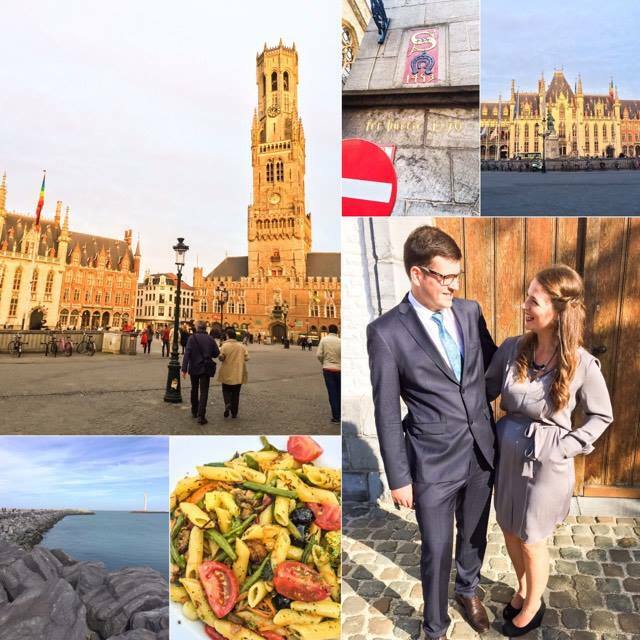 J and I just got back from a whirlwind of a trip in Belgium. We were there for 6 days total and in that time saw our friends get married in a castle in the most gorgeous wedding ever, enjoyed some quality time with J’s family and ate, dined and travelled around West Flanders where J is from. It was an absolutely lovely (but too short) trip. These Flourless Vegan Peanut Butter Muffins are supppper moist, made without ANY oil, and (like the name says) contain absolutely no flour. These banana bread muffins could not be easier to whip up. 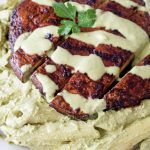 Place all the ingredients in a blender and blend, blend, blend away! 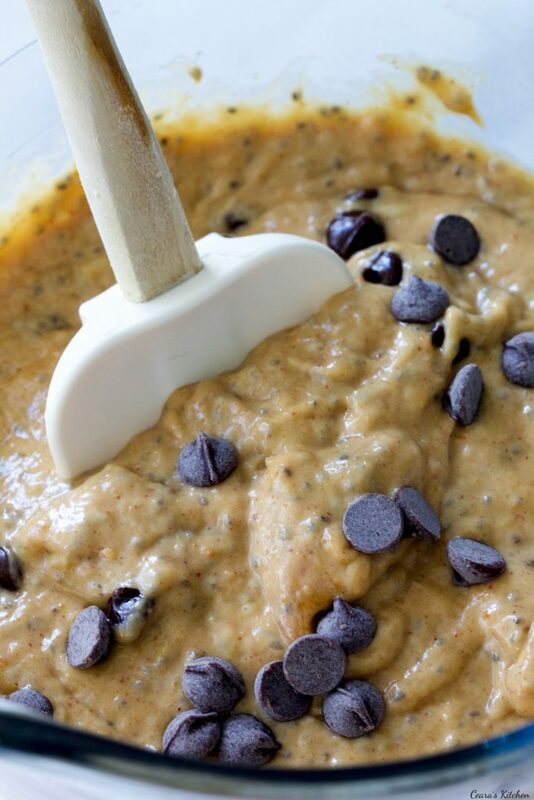 Don’t forget to stir in those chocolate chips (never optional). Bake for 20 minutes and enjoy these Flourless Vegan Peanut Butter Muffins as a healthy snack, on-the-go breakfast or even dessert. Enjoy! 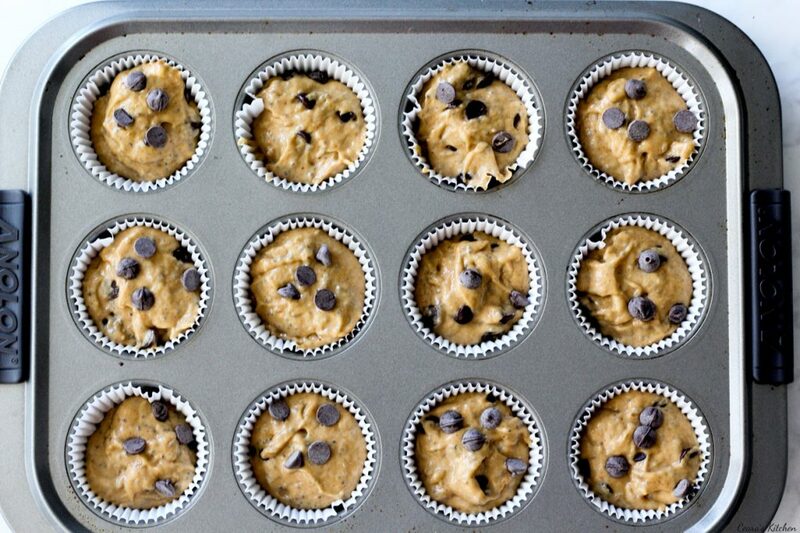 Flourless Vegan Peanut Butter Muffins ready in 30 minutes with only 8 ingredients. 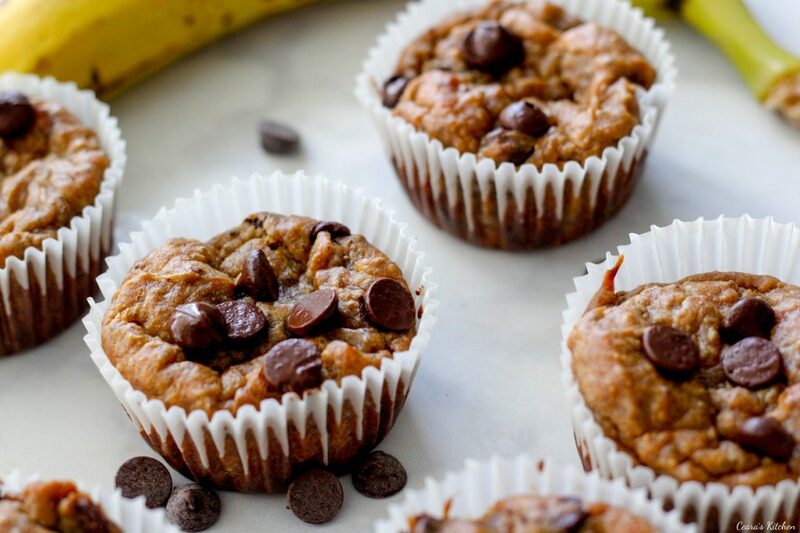 These Peanut Butter Banana Muffins are super moist, filled with melty chocolate chips and make the perfect healthy dessert or snack! Preheat oven to 375F. Line a muffin pan with 12 [url href=”http://amzn.to/2deTvrs” target=”_blank” rel=”nofollow”]muffin cups[/url]. Mix the chia seeds in a small bowl with 6 tbsp of water. Stir and leave to sit for 5 minutes until the mixture turns into a thick “eggy” consistency. 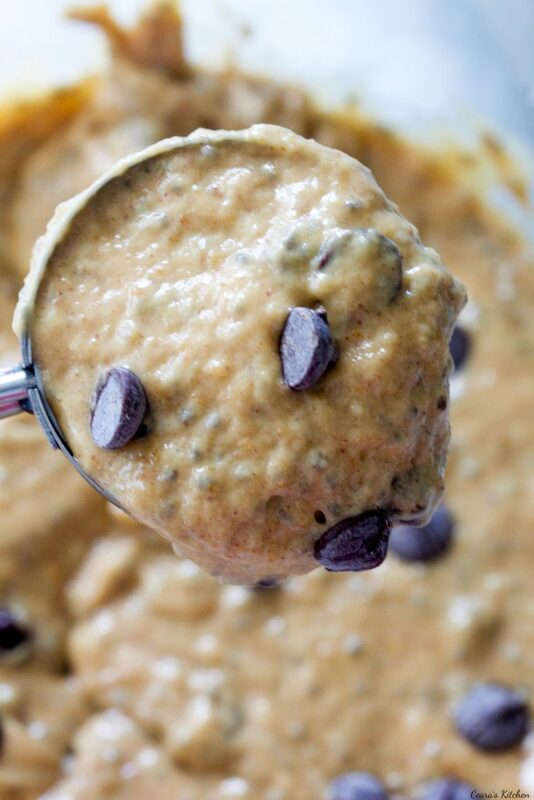 Add the chia eggs and the remaining ingredients (except for the chocolate chips) to a large bowl or blender. 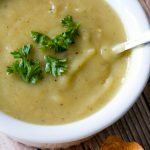 Either mix in a large bowl with an immersion (stick) blender or blend in the blender (about 5-6 pulses) until creamy smooth. Scoop (I use an [url href=”http://amzn.to/2deUFDe” target=”_blank” rel=”nofollow”]ice cream scoop[/url] – see photo) one scoop of muffin batter into each muffin cup. There should be about 3 tbsp of muffin batter in each muffin cup. Sprinkle with chocolate chips. Bake at 375F for 19-22 minutes until fluffy and cooked through. Leave to cool for 10 minutes in the pan before placing muffins on a cooling rack for 15 minutes to fully cool. 1) Make sure that your all natural peanut butter is stirred really well and [u]not[/u] oily. I use the Kirkland (Costco) brand but any all natural peanut butter will work. [br]2) Leave the muffins to fully cool before removing them from the muffins cups.